Submitted by dave on February 26, 2007 - 5:01am. 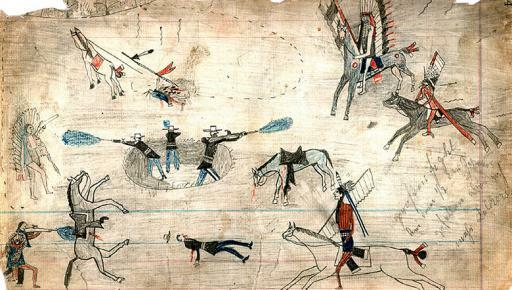 Kiowa ledger drawing possibly depicting the battle of Buffalo Wallow in 1874, a skirmish in the larger â€œRed River War,â€ a series of clashes between southern Plains tribes and U.S. Army troops attempting to enforce their relocation to Indian Territory reservations in what later became Oklahoma. View full size.